Kaczmarek, Ł., Bartels, P.J., Roszkowska, M. & Nelson, D.R. 2015. The Zoogeography of Marine Tardigrada. Zootaxa 4037(1): 1–189. doi: 10.11646/zootaxa.4037.1.1 Preview (PDF). ISBN 978-1-77557-823-9 (paperback); ISBN 978-1-77557-824-6 (Online edition) Reference page. Meyer, H.A., Tsaliki, M. & Hinton, J.G. 2018. First records of water bears (Phylum Tardigrada) from Swaziland. African Invertebrates 59(1): 47–53. doi: 10.3897/afrinvertebr.59.23191. Reference page. Kaczmarek, Ł., Michalczyk, Ł. & McInnes, S.J. 2016. Annotated zoogeography of non-marine Tardigrada. Part III: North America and Greenland. Zootaxa 4203(1): 1–249. doi: 10.11646/zootaxa.4203.1.1. Reference page. McInnes, S.J., Michalczyk, Ł. & Kaczmarek, Ł. 2017. Annotated zoogeography of non-marine Tardigrada. Part IV: Africa. Zootaxa 4284(1): 1–74. doi: 10.11646/zootaxa.4284.1.1. Full article (PDF) ISBN 978-1-77670-166-7 (paperback); ISBN 978-1-77670-167-4 (Online edition) Reference page. 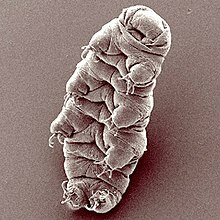 For more multimedia, look at Tardigrada on Wikimedia Commons. This page was last edited on 21 March 2019, at 02:19.